CDA Blog > New June 2011 brochure is here! New June 2011 brochure is here! Our new June 2011 brochure is now available, providing full details of our entire range of kitchen appliances, sinks and taps. We would be delighted to send you a free copy. Just call us on 01949 862000 and we will put a copy in the post for you. For more details, click on the title of the article. 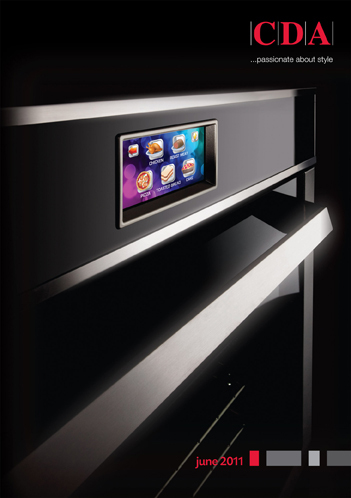 The brochure introduces a number of stylish new products including the HVC93 linear hob. This contemporary ceramic hob has 4 cooking zones arranged in a single row, so that there is plenty of cooking space and the linear format gives complete accessibility. It can be situated anywhere in the kitchen but it is perfect on an island or peninsular accompanied by downdraft extractor 3D9. Also launched in the new brochure is EVQ7, a chic, circular extractor, together with five burner gas hob 4Q5, both of which are designed to co-ordinate with our designer Q style ovens. Our popular range of undercounter winecoolers have been upgraded and now feature solid wood shelves, providing a touch of luxury and the optimum environment for storing fine wines. A new corner extractor and a selection of new taps including the TM4, a spectacular 700mm high chef’s tap, are also introduced in the new brochure. Obtain your copy by calling us on 01949 862000. CDA’s guarantee is now even better!